agrícola de Nicaragua de manera sostenible? 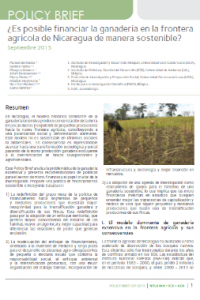 manner in Nicaragua’s agricultural frontier? The historically dominant model of extensive cattle ranching in Nicaragua has led to a concentration of land in few hands and pushed small farmers towards the younger agricultural frontiers. It thereby contributes to social polarization and alarming levels of deforestation. This model is not sustainable in either social or environmental terms. As a consequence, a technological and social transformation is indispensable, moving from an exclusionary production model dominated by cattle raising to diversification into silvopastoral and agroforestry farms. 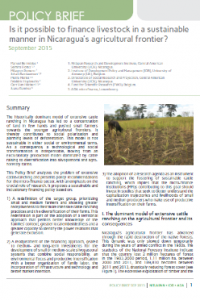 This Policy Brief analyzes the problem of extensive cattle-ranching and presents policy recommendations for the micro-finance sector, with an emphasis on the crucial role of research. 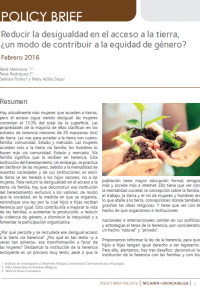 ¿un modo de contribuir a la equidad de género? representation in decision-making arenas, due in part to weak community governance. 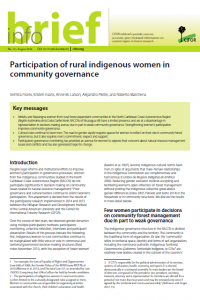 Strengthening women’s participation improves community governance. Cultural rules continue to favor men. The road to gender equity requires spaces for women to reflect on their role in community forest governance, but it also requires men’s commitment, respect and support. Participatory governance monitoring has provided an avenue for women to express their concerns about natural resource management issues and conflicts and has also generated hope for change.